Before January 20th, there’s nothing we can say. The table is still being set and no decisions have yet been made. Pundits and forecasters are doing their jobs by gleaning from facts and fiction the insights they’re obligated to report. For the rest of us, this lame-duck period isn’t a time to jump to any conclusions. Instead, it’s a time to collect information, learn all that we can, and evaluate what we know based on fact and not fiction. It’s also a time to learn more about organizations and non-profits that represent our points-of-view, socially, politically, economically, and Jewishly. On websites, we can read about organizations’ missions and who serves as CEO or president. And, we can subscribe to blogs and objective news sources, including ones from Israel. After January 20th, there’s much to do. As it should be in the case of any president, we should become better advocates than we’ve been in the past on issues that are important to us, individually and as a community. As this president takes office, there’s no question but that the times and circumstances are different. The rise in anti-Semitism, alone, is enough to call us all to act on behalf of Jews everywhere and other minorities, too. As the New Year began, HUC-JIR in Cincinnati, our Reform Jewish seminary, founded in 1875, was defaced with swastikas; and, closer to home at Memorial High School in Houston, anti-Semitic and racist graffiti drew the attention of the ADL and police for assistance to secure students’ security and safety. For these reasons, after the inauguration, it’s critical that we remain vigilant and ready to defend enduring Jewish values through advocacy work that engages our congregation and those who join us in our efforts. I will invite you to engage with Interfaith Ministries, where I serve on the Board with our Temple member, Jay Harberg; ADL, where our Temple member Marvin Nathan serves as National Chair, and Dena Marks serves as Associate Director; and, AJC, where Marcia Nichols serves as Immediate Past-President and many Temple members serve on the Board. Many organizations that represent us and our values will become more important to us as the year gets underway. Finally, the pulpit is as important as any blog, today; but, except in the most urgent of times, the pulpit is a place to promote and defend Jewish values but not political points of view. I will do my very best to avoid political punditry and focus on the values that are inherent to each of us and imperative to our security as Jews and citizens of our great nation. There are many things I am, but there is one thing I am not. As Amos said (7:14), “I am not a prophet, nor am I the son of a prophet.” Amos didn’t make his living as a prophet, and he didn’t predict the future like a seer or clairvoyant. Rather, Amos observed the facts on the ground and upheld the truths inherent in God’s teachings. The future about which he prophesied bore witness to enduring values that couldn’t be denied except at great personal and national peril. You’re not a prophet either, but Moses said long before Amos (Numbers 11:19), “Would that all God’s people were prophets.” None of us can predict the future, but all of us can bear witness to God’s teachings by advocating for truth and decency, by defending Jewish values and human rights, and by participating in the democratic process as engaged citizens. On January 20th, we’ll witness the inauguration of our nation’s new president. 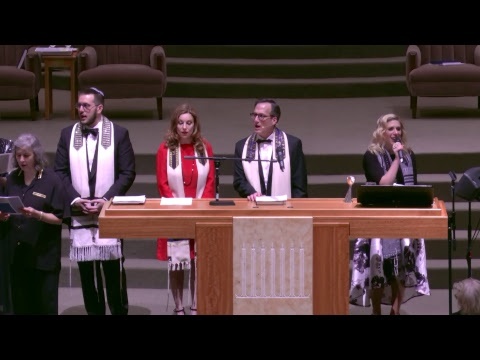 Later that day, Congregation Beth Israel will inaugurate its new sanctuary following months of planning and renovations to recover from devastating floods. Mayor Sylvester Turner, Mayor Pro Tem Ellen Cohen, Temple President Bruce Levy, our Rabbis and Cantor welcome everyone for a ceremonial Ribbon Cutting and joyful Sabbath Worship service at 6:30pm. May the inaugurations of our highest political office and our highest sacred space be prophecies of glory to God and all God’s people.